The Archaeological museum in Sofia is the oldest museum in Bulgaria. 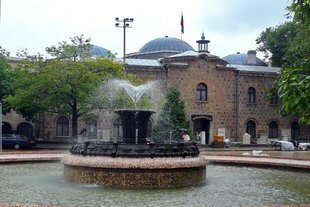 The Archaeological museum and Bulgarian Archaeological Institute are located in a former mosque. This is the biggest research archaeological unit in South-East Europe. The museum has been established in 1892 and officially open for visitors in 1908. In the museum’s halls there are permanent and temporary exhibitions with prehistoric objects, ancient treasures, masks and medieval monuments. Read more about the Archaeological museum at the Official Tourism Portal of Bulgaria here.